The Flamenco dancer Israel Galván juts his hand up in the air and calls, “Taxi!” flicks his fingers against the underside of his teeth, and pounds white flour—all in volcanically dynamic rhythms. 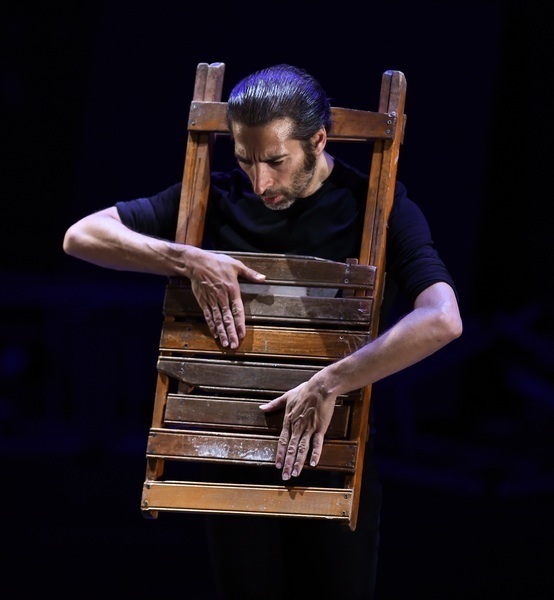 Far from being a traditionalist, Galván, who hails from a flamenco family in Seville, isn’t making waves internationally just because he distorts flamenco tradition. He’s a figure of admiration because his dance works push that tradition beyond its staid formulas, which include spectacle-like presentations featuring exoticism, tragic otherness, and hyper masculinity. 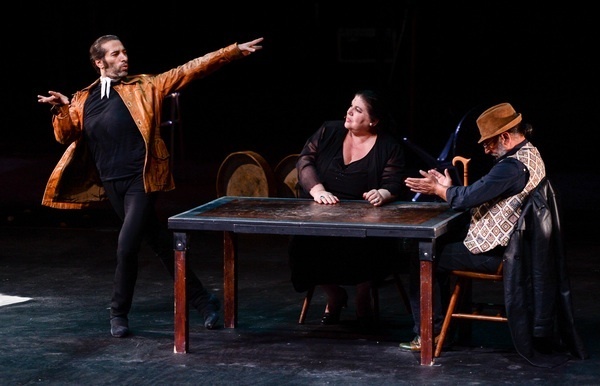 On the wide stage reminiscent of a factory removed of its objects, Galván sallies between stage right, where the young, avant-garde pianist Sylvie Courvoisier plays prepared piano, and stage left, where the middle age musician El Bobote and singer Inés Bacán are seated at a table. El Bobote comes to represent the father as he raps his hands in counterpoint to Galván’s rhythms while shouting salvos of approval. Meanwhile Bacán could be understood as the mother figure: her voice is as all encompassing as her Venus of Willemdorf body. 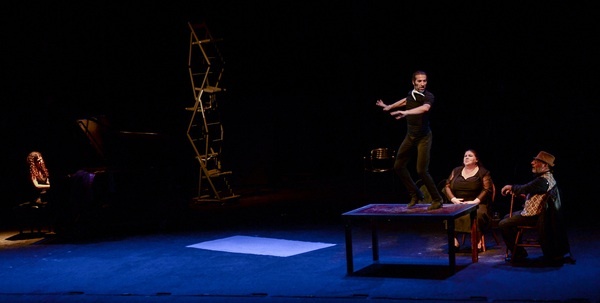 In the middle of the 80-minute work, Galván hammers his feet atop the rickety table in front of his “parents” while Courvoiser plays the opening bars of Igor Stravinsky’s “Rite of Spring.” Undoubtedly, Galván is thinking of the dancer-choreographer (and rebel) Vaslav Nijinsky. He refused to employ ballets steps in his dance work to Stravinsky’s music. A kindred spirit for Galván, Nijinsky distorted the ballet dancers’ bodies into totem-esque shapes in “Rite” and critics railed at this grotesquery. “Rite” also caused a riot. In “La Curva,” the only real violence occurs when Galván topples, on four separate occasions, a stack of chairs. They crash to the ground, but none present seem to care. It’s hard to cause a scandal in the theater these days. Dance in a masculine style. Turn the wrist with the fingers closed. Limited movement of the hips. Dance in a calm manner, without vanity. Harmony of feet, arms and head. Be beautiful, flexible and honest. Develop an individual style and emphasis. Keep a range of sounds in the mind, don’t put nails in the boots, dance on a simple stage and don’t use accessories. In “La Curva,” Galván flouts every single principle of Escudero’s except the call to develop an individual style. Galván repeatedly juts his hips forward à la Michael Jackson. He dances in black stretch pants and a t-shirt. He is never calm. Instead his dancing is like a cyclone, where the most inner curve resembles warp speed. Rather than striving for harmony, Galván employs physical distortion and isolation. An iconoclast, Galván is one that thankfully has a cause. He refuses to be imprisoned by the noble, male, flamenco dancing image. While it was carefully erected to celebrate the dignity of the gypsy, he sees no reason for keeping it. Those awkwardly stacked chairs, which crash to the floor with a swift pull in “La Curva,” symbolize Galván’s thinking. This entry was posted on Thursday, March 20th, 2014 at 7:08 pm	and is filed under The Torn Tutu. You can follow any responses to this entry through the RSS 2.0 feed. Both comments and pings are currently closed.